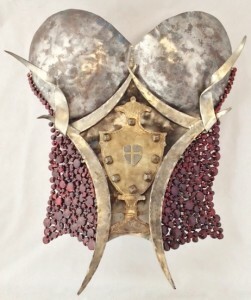 I have been working hard on building a body of work call “The Maid of Steel Collection” that includes ladies armored breastplates. 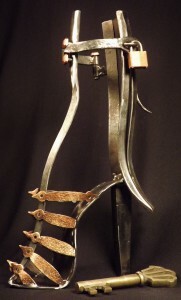 The breastplates are a symbol of feminine strength, an example of mettle while being beautiful at the same time. I submitted one of the breastplates into juried all Colorado art exhibition…. 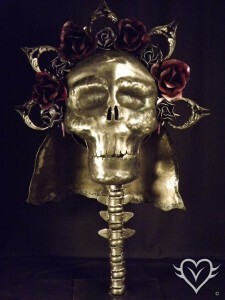 it was accepted along with my “Gatekeeper Steel Heel” and “Antepasado” a La Catrina skull with roses and a veil. The Exhibition will be held from September 26 to October 26, 2014, Main Street Fine Art Gallery, Evergreen, CO. The awards ceremony is on the opening night September 26th with most of the artist expected to be in attendance, should be a fun night. They are awarding: Best of Show: $500, 1st Place: $300, 2nd Place $200, 3rd Place $100, and 3 Merit Awards. There is one juror for the art entries, Kathy F. Montgomery. Kathy has worked with clients on projects that include art collection maintenance, acquisition, and planning. She has served as the National President of the American Society of Interior Designers, and volunteers as a Board member for Art for the Mountain Community in Evergreen, and at Evergreen Fine Art for “Weekend in the West”. The show itself “The Evergreen Art Open” is hosted by the Evergreen Artists Association, a volunteer non profit organization that was founded in 1958 by artists who joined together providing support and creating an organization for the advancement of the visual arts in our Colorado mountain community.